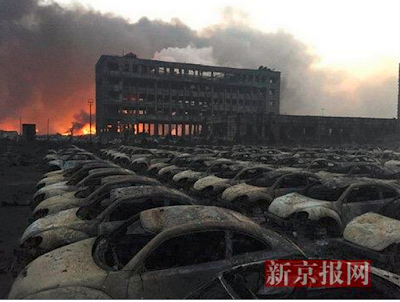 A shipment of explosives went up in flames in the Chinese city of Tianjin. The Guardian reports least 17 Dead and Hundreds Injured. 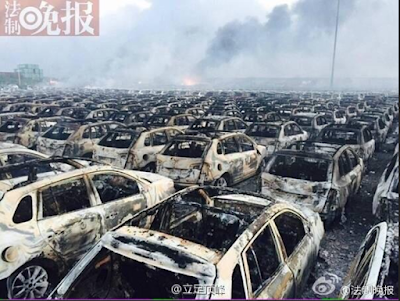 Hundreds of people have been injured and at least 17 killed after a series of devastating blasts sent a fireball hundreds of metres into the air at an industrial port in northern China. 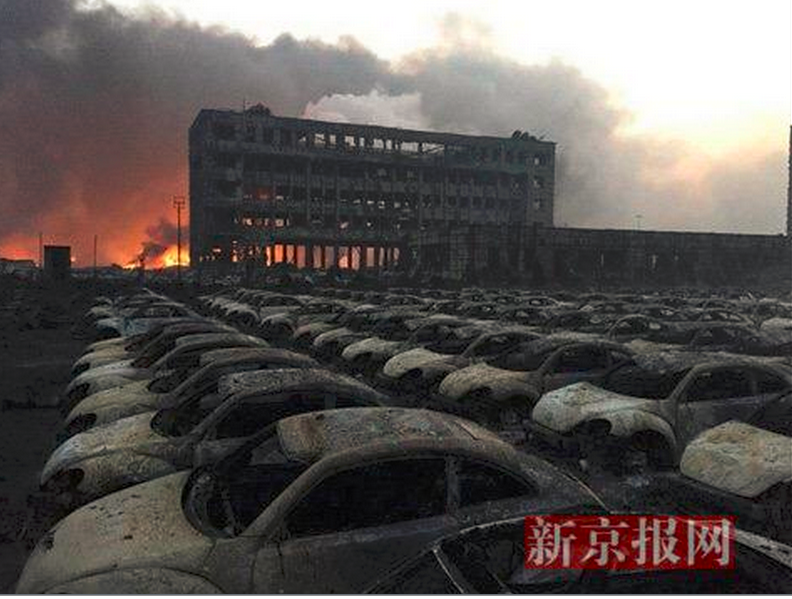 A shipment of “dangerous goods” in a warehouse went up in flames shortly before midnight local time (1600 GMT), state media reported, causing explosions so strong that they shook homes on the other side of the city and sent flaming debris arching over nearby high-rise buildings. Hundreds of injured people crowded into hospitals, arriving on foot and by car after emergency services were overwhelmed. The first blast was equal in strength to the detonation of three tons of TNT, while the second was the equivalent of 21 tons of the explosive, the China Earthquake Networks Centre said. 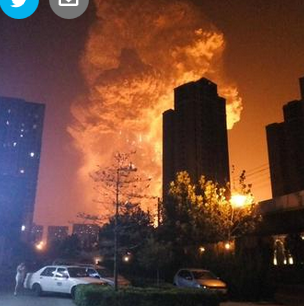 The explosions, which took place within 30 seconds, were so strong that they registered at a nearby earthquake monitoring centre, the official People’s Daily reported on Twitter. The US Geological Survey registered a series of seismological actions at a seismometer station in Beijing, which is more than 160km from the blast. Videos posted on social media showed a pillar of flame that dwarfed nearby high-rise buildings, and shook homes several miles away. The blasts ripped offices and homes apart, and sent chunks of masonry flying through the air, pictures showed. One car was crushed by the debris and another was half buried in a crater in the road. 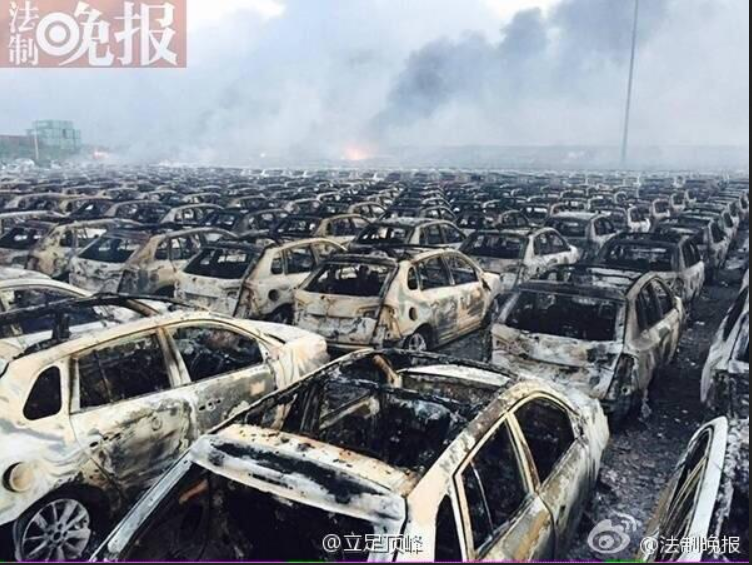 Link if video does not play: Tianjin Explosion. Tianjin is something like the 10th largest port in the world by volume. If a lot of exports were in port or waiting for shipping, I would imagine there could be some significant damage. Quoting from a social media spot I found: "I work for a Logistics company in the US and we have many shipments there right now. The office is upside down right now. It's not relevant to my company but many ocean carriers actually lost many crew members that were on the ships. Condolences to the crew member's families. Our staff usually leaves at 4:30ish, it's 5:20 right now and everyone are still here. People that called off for today are now all here. Doesn't looking like we're leaving soon since it's morning in China and people are waking up. Angry customers (because they didn't buy insurance) are calling in to see whether if there shipments are okay. We have absolutely no way of finding out. Our average wait time increased from 20 seconds to over 40 minutes now."